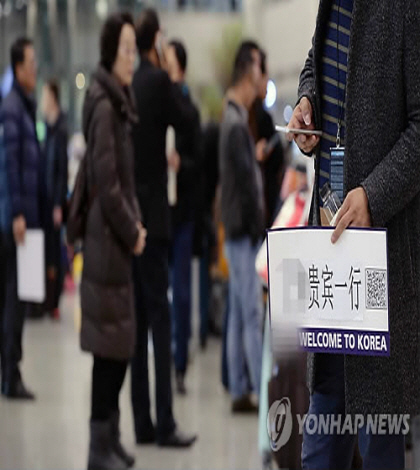 SEOUL, April 13 (Yonhap) — The number of Chinese passengers traveling via Incheon International Airport in the first 10 days of this month dropped by 37 percent from a year ago amid a diplomatic row over the deployment of a U.S. missile defense system, its operator said Thursday. A total of 226,066 Chinese nationals used the airport, South Korea’s main gateway west of Seoul, from April 1 to 10, according to the Incheon International Airport Corp. (IIAC). The number is down 37.7 percent from 362,647 tallied in the same period last year. The local tourism industry is battered by Beijing’s apparent retaliation against South Korea for the ongoing deployment of the Terminal High Altitude Area Defense (THAAD) on its soil. Since March 15, China has banned travel agencies there from selling travel packages to Korea, with its cruises no longer making stopovers at Korean ports. Given the current trend, the total number of Chinese tourists visiting South Korea could drop by half to some 4 million this year, from some 8.07 recorded last year, the airport operator forecasted. The IIAC said it will put efforts to attract individual tourists from China, as well as travelers from other neighboring countries such as Japan.